Pears go well with cheese, it’s true. Their acidic sweetness contrasts nicely with a salty, forward variety like blue or something grassy and rich like a raw milk cheese. Put them together on the plate, add a few fresh walnuts and a dollop of honey or jam, and you’ve got a decadent afternoon snack best enjoyed in late summer shade with a view. Pears pair with less gustatory partners just as well. Their floral-scented, syrupy flesh seems a natural embodiment of spring or summer, but pears are all autumn. Flowery notes conjure visions of yellowed grasses and chattering leaves while buttery sweetness foretells the mineral chill of plush summer air turning crisp. Only their coloring plays the part honestly, green that fades pale and blushes (as some varieties do) in sync with deciduous leaves. 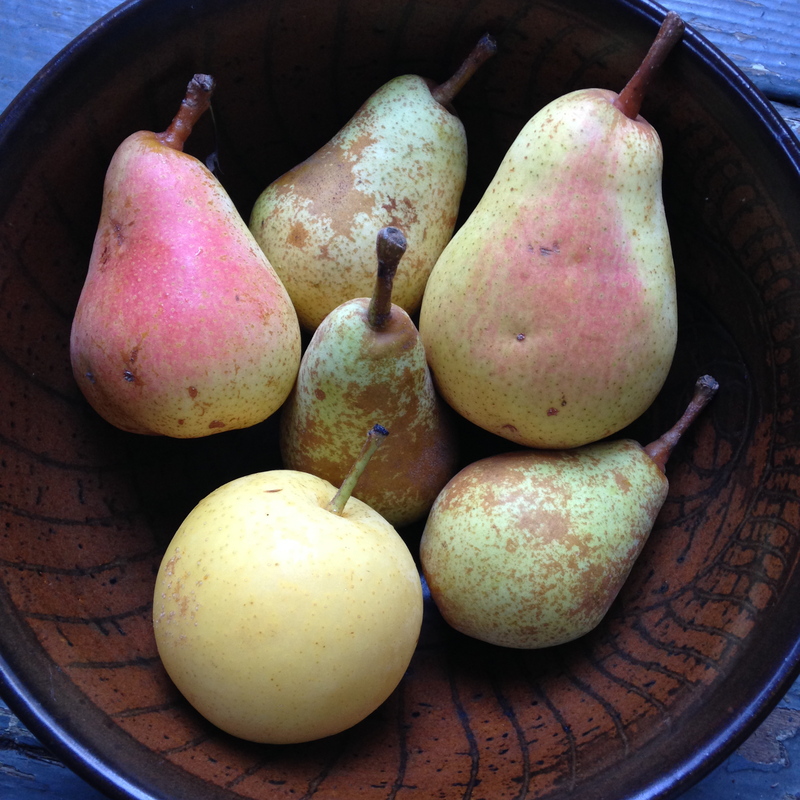 Savoring a pear on a walk in the woods—among the scent of dry, brittle earth drinking the first fall rains—or in a wetland—freshly filled with migratory birds beginning to wander south, honking in anticipation—these are my favorite accompaniments to pear. . The texture and flavor of a pear rely on counter-intuitive timing. We are used to picking fruit when its ripeness is obvious. Pears require that we see ripeness before it advances, and that we place our trust in subtle hints. Left on the tree, pears ripen from the core out, meaning their center softens and begins to spoil before your fingertips will feel it. As the fruit develops on the tree, its cells lignify, causing that gritty pear texture to intensify. A fully tree-ripened pear is a mealy, sandy, unsatisfying thing. A perfectly ripe pear is not, from the plant’s perspective, ripe at all. Our tastes and the tree’s part ways after the fruit’s initial maturity concludes. At this stage, the pear has reached its maximum size, its seeds have formed, its cells have filled with starches and flavor compounds, but its flesh remains firm and tannic. To achieve silky pear sweetness, the fruit must be picked before tree ripening initiates, the best indicator of which is a twist of the wrist: if a pear stem releases with a single upright turn, it’s ready for picking; if the stem resists, it’s best to check again soon. Once picked, a pear’s flavor depends on how you cure it. Sitting on the kitchen counter, it will sluggishly march into decline, developing few sugars and losing any desirable texture it may have had. Put in the back of the refrigerator, pears will sweeten and develop their succulent texture in a few days to several weeks, depending on the variety. Cold makes the difference because it slows mechanisms of decay while promoting the production of ethylene, a gas that initiates the ripening stage of most fruits. Commercially grown pears are stored in giant warehouses at 30-degrees F, which significantly extends their shelf life, sugars acting as antifreeze and the ethylene slowly setting to work. Home gardeners have refrigerators, which typically cool to temperatures around 40-degrees F, a setting that will still cure pears to perfection, but which requires you eat them more quickly. Depending on the variety, pears stored in the home refrigerator will last from September to December (for Autumn pears like Bartlett and Seckel) or February (for winter storing varieties like Bosc or Anjou). You can eat a cured pear right out of the fridge, but to finish its ripening (and develop the last of its sugars), let it rest on the counter a few more days. Pears with longer cold storage will need less room-temperature resting. Pay attention to the fruits: their skin should be bright, their surface plump and slightly soft. A pear left too long will become squishy or start to brown, a pear taken out of cold storage too soon will be firm and too green. The best place to check for the right level of softness is on the pear’s neck, just around the base of the stem. If the flesh here gives with a gentle press, it means the fruit is at its peak. The buttery pear we know today is the result of French and Belgian growers selecting for that trait, perfecting the first varieties of contemporary pears around the early 1700’s. Previously, European pears were crisp, like their Asian pear cousins, ripened on the tree and much more reminiscent of their rose family kin, the apple. . Living in a pre-refrigeration world, these early growers likely experimented with cellar storage, picking their pears at different times to see how long they would keep into the winter. A good root cellar maintains a temperature between 32- and 40-degrees F, not far from commercial warehouses today. Early growers likely learned from their cellars how the fruit improved with cold curing and from that knowledge developed a range of varieties that performed well with early harvest and cold storage techniques. And aren’t we glad they did: honey-flavored Bartletts for walks in the woods, firm-fleshed Anjou and Bosc for topping tarts, earthy-spiced Seckel and velvety-sweet Comice for poaching or pairing with cheese, are our inheritance. And though the fruits may have changed over time, autumn, as always, remains theirs. Sarah West is a gardener, eater and admirer of the agricultural arts. She gladly spends her Sundays as assistant manager of the Hillsdale Farmers’ Market, basking in the richness of its producers’ bounty and its community’s energy. Find archives and more at http://thefatofthelandblog.wordpress.com.